Nineteen species were recognised when the Sciarid fauna of New Zealand was reviewed for the first time (Tonnoir & Edwards 1927), and most of them were placed in the catch-all genus Sciara Meigen. 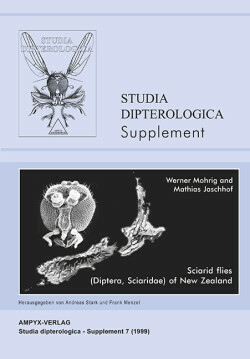 Following a recent revision of types (Menzel & Mohrig 1999) and study of a large amount of new material collected by the junior author on New Zealand´s North Island in the southern summer 1992/93, the authors now list 53 species of Sciaridae, 40 of which are described as new to science. This also provides a more solid basis for zoo-geographic discussion of a phylogenetically old group as it occurs in a biogeographically interesting region such as New Zealand, known for its many endemics. 51 apparently indigenous species belong to 6 genera that are also distributed in the Holarctic. Corynoptera Winnertz alone is represented by 32 species. There is no endemic taxon at the generic level. Faunal relationships with the southern Palaearctic and with Micronesia are discussed, with Epidapus Haliday and Corynoptera serving as examples. Analysis of the adult morphology leads to the conclusion that the New Zealand Sciarid fauna includes at least two faunal horizons which can be correlated with Tertiary land bridges known as the Inner and Outer Melanesian Arc. The number of Sciarid species imported to New Zealand by man´s activities is very small. Keys to genera and species combined with detailed illustrations of all the important diagnostic char-acters enable the males of all Sciarid species so far recorded from New Zealand to be identified.